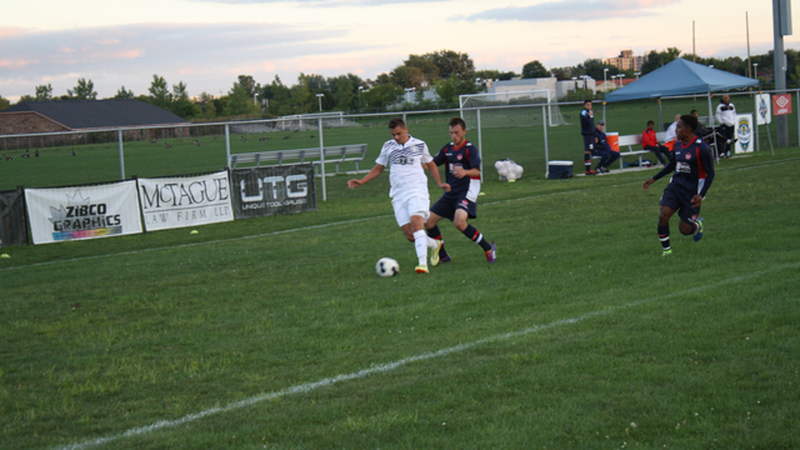 The air at this early fall match between Windsor Stars and Vaughan Azzurri game was crisp with an autumn chill, and nearly luminescent with the smouldering floodlights of McHugh Stadium in Windsor on Saturday night. The visiting Azzurri side fielded a young squad up against a veteran Stars team, in a marked contrast of approach. The first minutes of the game provided suggestion of an open affair to come, but both sides lacked the composure necessary to create any immediate results in the final third. One early bright spark was Vaughan forward Dayonn Harris, who provided displays of amazing control and speed, troubling the Stars defence with his sharp cuts and changes of pace. This pressure created several chances for the visitors. Austin McGlashan crossed the ball in from the wing, but the attempted finish from teammate Harris lacked any kind of finesse. Vaughan quickly proved to be a handful in the midfield with a great energy and industriousness from the young side, hustling to intercept and block passing options to the Windsor forwards. Azzurri first broke on the counter in the fifteenth minute, but Daniel Maxwell’s shot from just inside the box didn’t have the strength to beat a strong fist from veteran keeper Anthony Santilli. Although chances fell early to Vaughan, Windsor slowly started to impose their will on the game. Cristian Dragoi made a tantalizing run down the right hand side, and cannoned an attempt off the upright. The home side was unfortunate not to be up one. The Stars continued their spell of pressure. A corner kick from David Kadoic found defender Pat Lapera in the box, whose shot beat the keeper but once again the crossbar came to Vaughan’s rescue. Even though the Stars were suddenly looking the more likely to score, Vaughan broke the deadlock first in the thirtieth minute. Harris made a menacing run into the box, and the forward was rather fortunate that a mis-controlled ball rolled towards his teammate Austin McGlashan. From ten yards out, the forward displayed excellent composure by placing the ball in the corner of the net. Not two minutes later, Harris was again able to break free of the Windsor defence. A remarkable leg save from Santilli made sure the visitors were still within a strike away of deadlock at the halftime whistle. The second half couldn’t have started any better for the home team. Kadoic put in a well placed cross to Stephen Ademolu, the midfielder showing remarkable poise to smash a diving header towards goal. Vaughan keeper Dayne Stclair denied the initial shot, but the rebound only rolled back towards Ademolu, who - alert to the rebound - swung his leg while still on the ground and scored to tie the game two minutes into the second half. After the initial excitement from the equalizer faded, both teams settled in and neither looked like they were going to threaten the scoreline. The early-second half display was a great example of defensive aptitude, with each team cancelling the others' attacking threats. Yet it would be a shot from outside the box by goal scorer Ademolu that would sting the palms of the keeper in the sixty-eighth minute, and signal unstoppable late pressure from the Stars to take all three points. Kadoic had a great chance in the eighty-first minute after the left-winger had time in the box after shaking off his defender, but the shot was placed agonizingly wide of the target. Yet four minutes later the Stars finally broke the defence, as Dragoi clinched all three points after rocketing a cleared ball back towards the Vaughan goal; the Azzurri keeper St. Clair stood statuesque as the defenders impeded his vision. With sunset taking over, the final whistle blew on this one; Windsor had held onto a one goal lead, and defeated the visiting powerhouse Vaughan Azzurri.